Students will be able to discover how environmental factors affect the expression of the genome. Genetic makeup is only part of the story. How is it that two genetically identical twins are not really identical. Why is it that the DNA from an older twin set differs more significantly than the DNA of a younger twin set. What factors could account for this? In the directions for the turn and talk I identify which student (left or right) will answer the first question or second question, and give sentence frames for how the second student should answer (agree/disagree). In the Turn and Talk video clip, notice how the students physically turn to each other in order to hold the discussion. 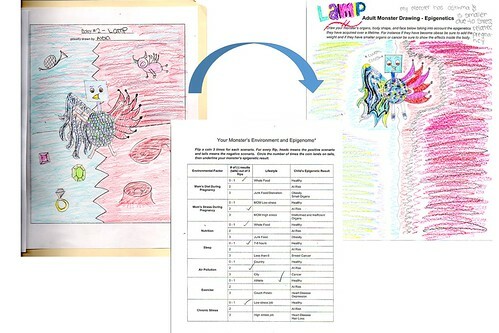 After dividing students into partnerships (I change it up by using Clock Buddies), I ask students to bring out the monster drawings and genotypes they created during the Monster Factory lesson, and distribute one copy of the epigenetics scenarios per partnership. I ask a random student to read the directions, and then, as you see in the clip, model the reading, thinking and underlining of the "Mom's Pregnancy, Whole Food" section. As I finish reading this paragraph, I ask myself, "What choices did the Mom make that gave the result of a normal-sized baby with healthy organs? I see she ate whole foods so I underline that and also underline the low fat and plenty of water since I know that these are healthy habits to have. I then give the students some time to read and underline their sheet, circulating the room listening in on the conversation. I am looking for the correct identification of the habits that could modify the phenotype of the individual as well as for respectful interactions among the students. During this time, I am circulating the room, providing immediate feedback, and eliciting the reasoning the students have for underlining specific items as they clarify their thinking. I tell the students that they are now going to use what the learned to see how epigenetics can modify the monster they created. I distribute the Monster Epigenome sheet, read the directions with the students and solicit clarification questions. I distribute one coin per partnership, making sure the students understand that each student has to flip three times (total of six flips per partnership), and only the result of their own flips will affect their monster. Note to teachers: Using work previously done by the students as the backbone of this lesson is known as the bridging strategy. In this classroom video I explain how the bridging strategy helps students take ownership of the work and bridge the conceptual understanding between both lessons. As the students are working on this and then drawing their modified monster, they are using the Crosscutting Concept of cause and effect relationships to predict phenomena as well as analyzing their results (SP4) noticing that phenomena may have more than one cause (SW1, SW2, SW3, SW4). Their explanation for how the environment affects their monster is presented in the form of a drawing, which is based on solid data (SP7). Note to teachers: In order to transition students effectively between the different portions of the lesson I use a variety of attention grabbers. Watch as I demonstrate two of them and give the reasoning behind their use. I close this lesson by asking students to have a brief table discussion about what they learned today showing how their thought have changed.